How To Make Easy DIY String Christmas Tree Decorations That Look Fabulous! Don't you just love making crafts for the holidays? I sure do! I was looking for something super easy and classy looking. After looking around I found a video that had the perfect craft project for me to make, it was simple to make but looked like a store bought item. The best part is that you don't need a lot of supplies to make them and they look Amazing when your finished. 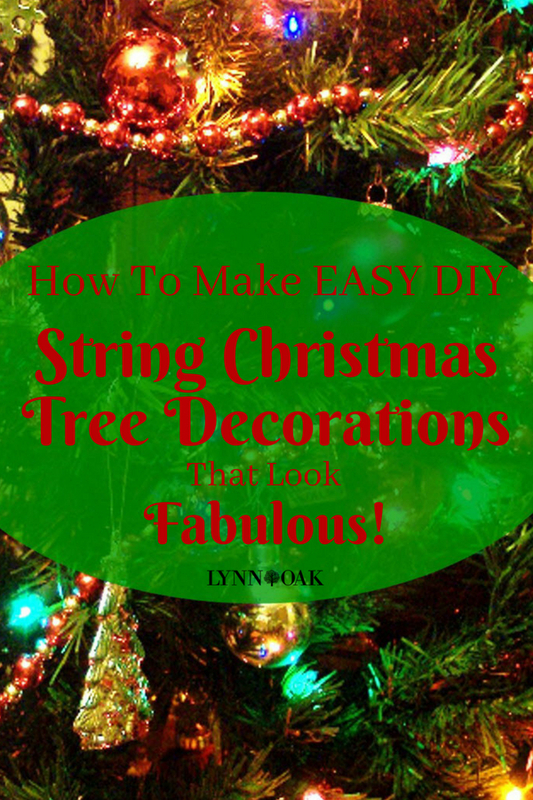 I'm going to show you step by step How To Make Easy DIY String Christmas Tree Decorations That Look Fabulous! In the video you will also see more projects that are equally as fun and easy. But I'm only going to give you directions for the first project, if you try the first one and like it then later you can pick out another project and make it too! 1. Cover the your cone shaped foam with cling wrap so that your string won’t get stuck to the foam and you can remove your string tree from the cone after it's finished drying. 2. Now add some sewing straight pins to your cone, just add them randomly around the cone, spacing them out. You will want to make the base of your tree flat so make one roll evenly around where you want the bottom to be, so that it will stand flat when it comes off the cone. You will want to add one pin slightly under where your base will be, this will be where you start winding the yarn. 3. Next you want to add glue and water in a bowl to make a paste. I would mix half water and half glue. Just fill the bottom of the bowl. You don’t want to make too much paste at first, and you will more than likely have to make a second or third batch of paste, but that’s better than mixing up too much glue and water at first, then not using it. You don’t have to be perfect. You just want your glue to be watered down some so you can easily work the glue into the yarn. Mix up the glue water in the bowl until it’s mixed together well this will be your paste. 4. Cut a few long pieces of yarn. Doesn’t matter how long, you don’t want it to be too long as you will be doing this in stages. It will be easier to manage smaller pieces of yarn rather than getting glue on all of your yarn. This way you can make more cute trees with the left over yarn later if you like the first one. Yah! 5. Add one of your cut pieces of yarn to your glue water and mix around until the yarn is all wet with the glue mixture. 6. Now it’s time to start making your tree! Start with one end of the yarn and wrapping it around that one special pin that you added under where your base will be. This will allow you to glue the extra yarn to your base when your finished so that your tree will stay together better and not come undone. Then just continue to wrap the string along the pins, randomly catching the pins as you wrap, making different patterns, criss crossing as you go along. There’s no right or wrong way to do this, you just want to make a random design as you go so that you fill up the entire cone with yarn and when it dries it will be fabulous string christmas tree that you can add decorations to or even paint when your finished. 7. Once your happy with how the tree looks, then set it aside to dry. Once the tree is dry, you can remove all the pins from the cone and carefully remove the string tree from the cone. 8. Now it’s time to decorate your tree! You can leave it plain if you want or even spray paint it gold. But I’m going to show you how to add ornaments to your tree. Gather up your little pearl beads along with tweezers and hot glue gun. Now pick up a bead with the tweezers, add a dot of glue to it with your glue gun, place the bead with the glue on it anyplace on your tree and hold it there for a few seconds and then do the same thing again, over and over, until your happy with how your tree looks. Doesn't it look FABULOUS! I love these trees! Now wasn't that simple? So easy, yet it looks like you paid big bucks for them at the boutique. Just think of all the possibilities, you could make them and spray paint them gold or red and green. You could add small round ornaments to them or pom poms. Grouped together they make a stunning display for your fireplace mantel. I could go on and on with more decorating ideas and I bet you can too! Go make these cute String Christmas Tree's for your home this year! Then give the other projects a try in the video they are all super easy and oh so cute!